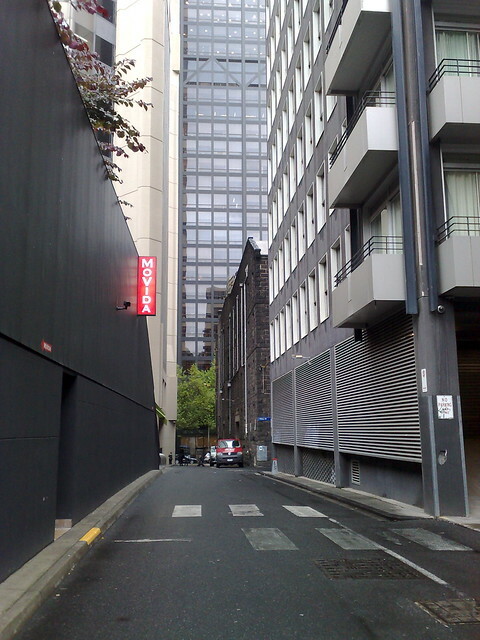 This is Little William Street, just east of William Street. It appears that two attempts have been made to establish a zebra crossing here, though I can’t figure out why. There’s little traffic, virtually no footpath, and no significant building entrances or other traffic generators to cross between. Perhaps the landscape here looked radically different in the past, but I can’t imagine the traffic has ever warranted it. Maybe they’re just testing the paint and thought nobody would ever notice it? If you stop crossing where the lines run out, and just stand there, eventually you’ll get hit by a car or truck. And that will prove the need for a crosswalk in that location. And no crossing signs either, so it’s not an actual crossing (and wouldn’t be even if it had a full complement of stripes). The old photo was a clever find. Perhaps they thought that doorway wasn’t visible to passing motorists and therefore pedestrians may seem to appear from nowhere. Then when they put in the new building opposite they moved it a few metres not realising it wouldn’t serve its intended purpose. Or the alternative explanation is that it’s to mark some secret location we’re not supposed to know about. maybe it’s not a zebra crossing but some code only drunk hipsters stumbling out of movida can decipher? @Jen, actually there is a paint testing area on the Nepean Highway in East Brighton, just north of Hawthorn Road. @Jeremy, maybe Cafe 9 3/4 is there somewhere? People walking out of that doorway on the left ( is it a fire escape ? ) can’t see the cars. And the cars can’t see them. Ah yes, Streetview shows the previous layout had an exit more or less where the zebra crossing is.